I have been working on this sweet little doll quilt since retreat. I started with an old piece of quilt top made of small strips. They were all different sizes, widths, weights and colors. It was very charming, but did not lay flat. Nor did any seam match any other seam. All of these quirky things made the top seem more primitive (which it was) and homemade (which it was). But in the end I did not like the way it was put together, so I decided (against all prevailing opinion!) 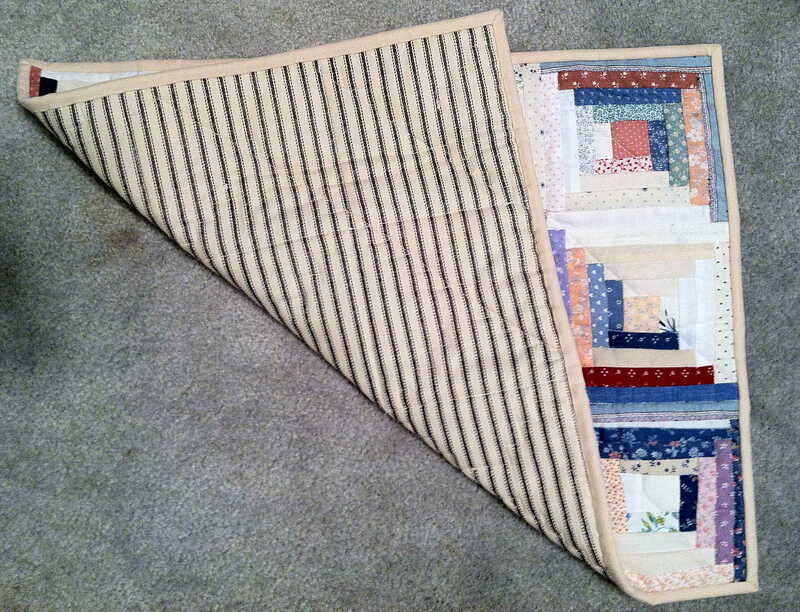 to take the quilt apart, recut and start over. At the time this seemed like a sensible (to me) idea. I had done a similar thing with a previous quilt and it worked out very well. 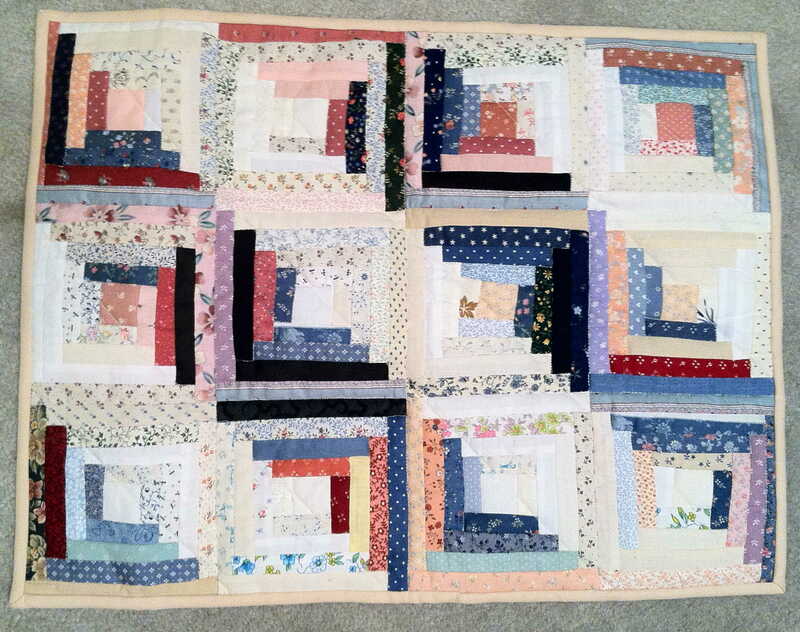 Granted, the pieces then were larger and triangular and redesigning the quilt made a huge difference. But this was going to work too, even though the strips are very small and so varied that redesigning will make almost no difference. But I was not to be deterred! I was on a mission! So I spent 3 days . . . . you heard me, 3 days taking a quilt top the size of maybe two placemats apart AND recutting the strips. 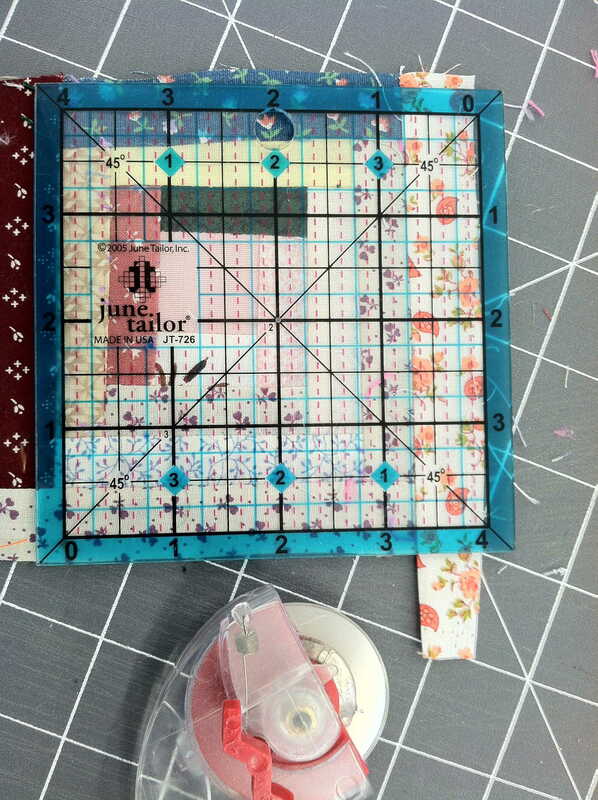 To make the strips the same size, I had to go down to 3/4″ wide. That is tiny! Here is a pic of my strips, dark and light. 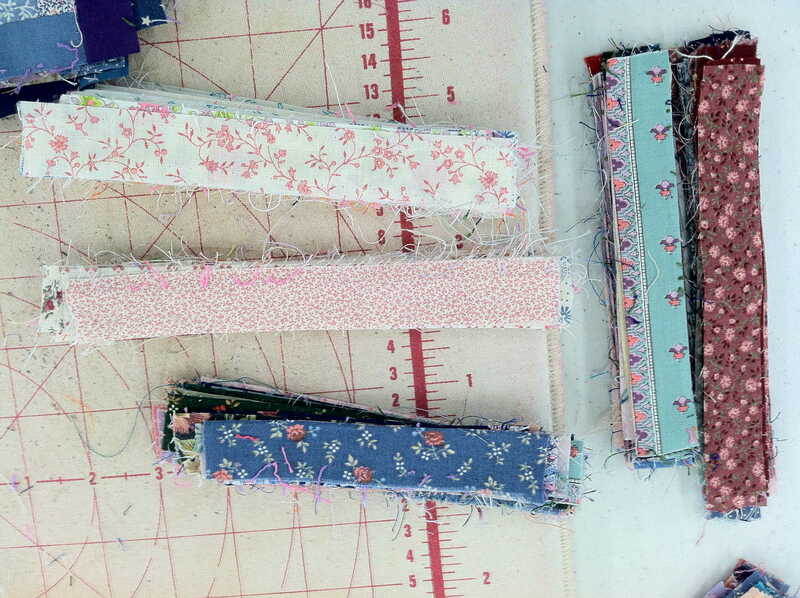 The piles are so small, I can’t believe how long it took to make them! 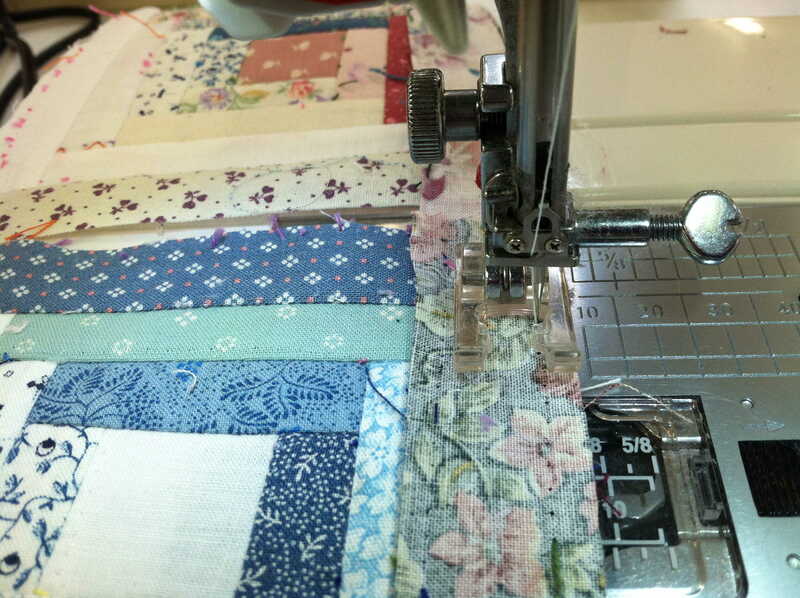 Then I started to reconstruct the quilt. But I had to reduce my seam allowance or the strips would just disappear. My new seam allowance was between 1/8 and 1/4 inch. That is technically 1.5/8 inch! I used a Log Cabin design because the doll bed is primitive looking. I pressed all the seams to one side. Then squared up each cabin square. I wanted those seams to match this time! By arranging the squares, I got this striped effect of the light and dark colors. I really like it, especially on such a small quilt. I used thin batting and backed the quilt with a black and cream ticking. 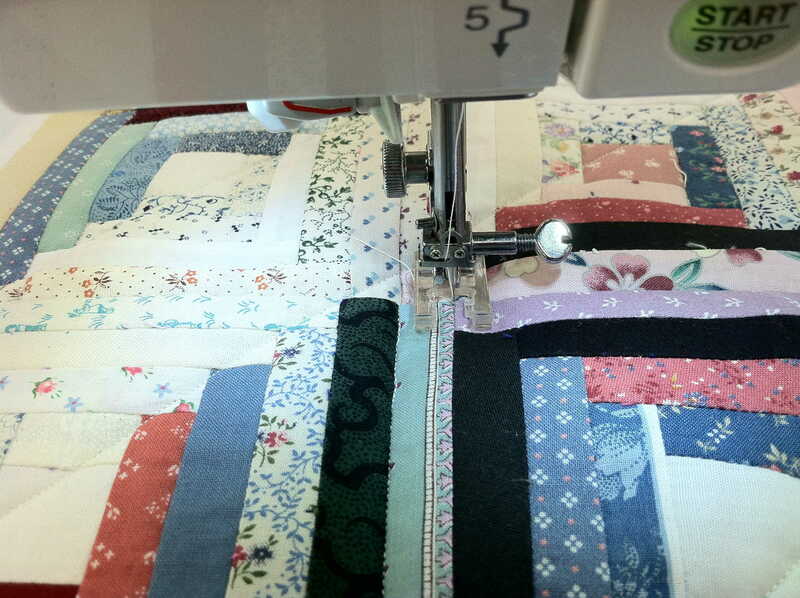 The quilting is mostly “stitch in the ditch” or stitch in the well of the seam. I used the wrong side of the ticking for the mattress cover and pillow (pictures and tutorials next week). The binding is a cream muslin that goes with the front and back. 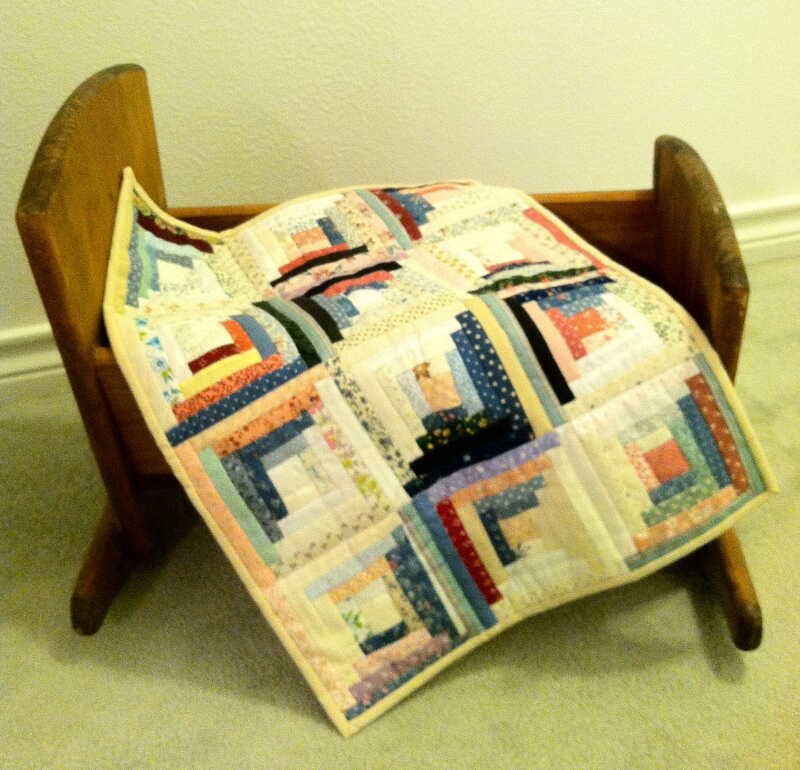 Here again is the finished quilt in the doll cradle. In the future, I will show you the mattress, pillow, and sheet set I am making also. All of my dolls are begging to be the first to test the newly linened bed! I don’t know, some of the stuffed animals have been especially good lately, too. 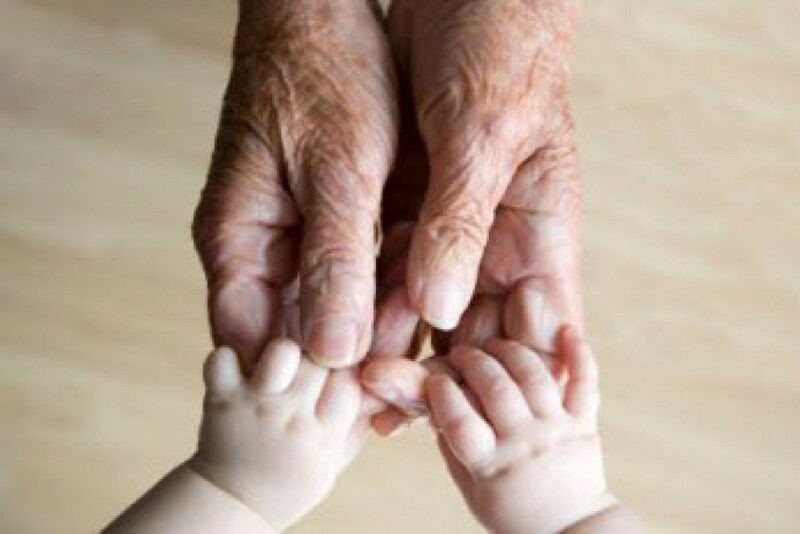 What’s a Granny to do? Maybe have a pajama party and let them ALL stay in the cradle?! WooHoo! Sounds like fun! 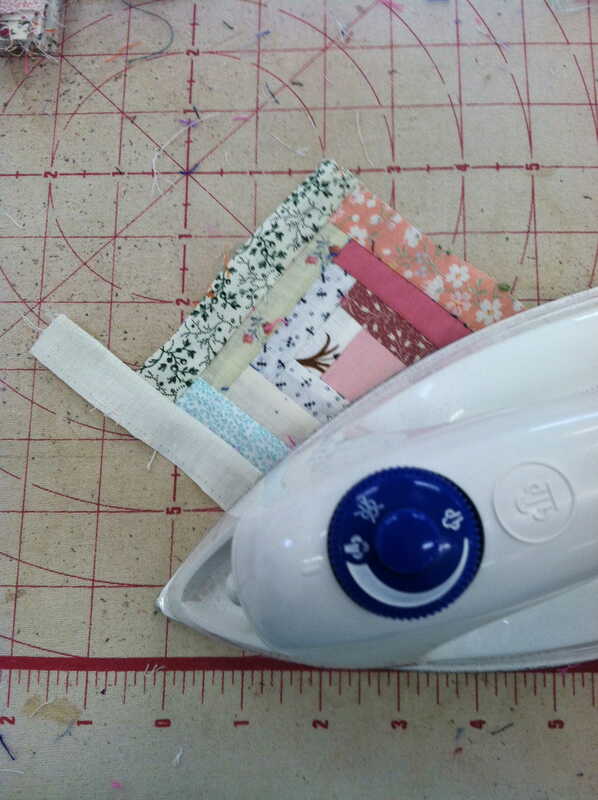 This entry was posted in In the Sewing Room and tagged doll blanket, Log Cabin, quilting, redesigning, smaller seams, tiny strips by The Village Granny. Bookmark the permalink. Thank you, Sweetie. I kind of like it too. But waaaaaaay more work than I ever thought possible! It’s the small things that always surprise you! Right? So beautiful. I am so in awe of you. And I am in awe of you too!